So recently I was part of the #physedsummit round table discussions in which shared a lot of good practice (http://goo.gl/Q1ryyi) , and since then a small Voxer group has formed to carry on that sharing. As I have said previously Voxer is great to carry on those discussions about different topics. Part of the districts goals are to increase writing through the writers workshop method, and in PE we are encouraging students to write more. So part of their grade is reflection and analysis, and this also seems to be part of the IB structure as well from discussions I have had. I wanted to come up with a way in which they could reflect on their performance but also include a small writing piece. So at the start of the unit I had broken down the skills into the different stages of solo’s taxonomy, and then asked them to pick which level they thought they were currently at for each stage. 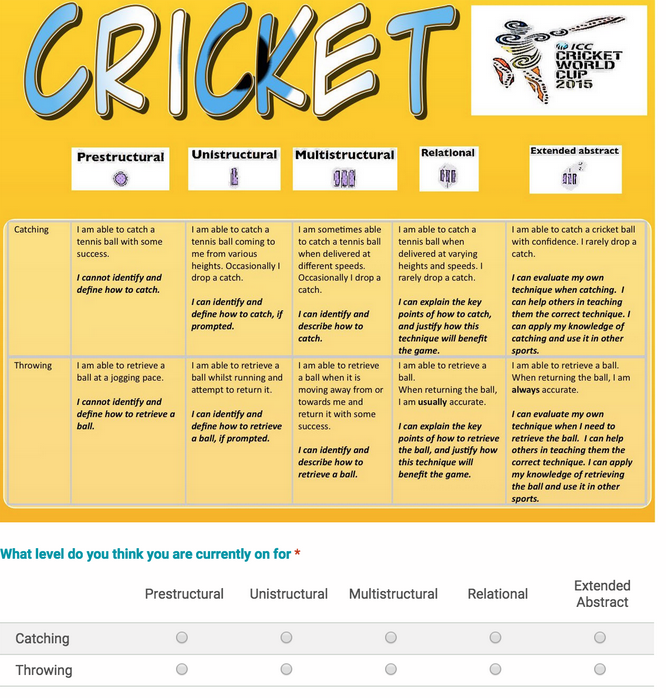 After each lesson I asked the same questions and the students had to fill in their google forms as part of their homework, as not to take away from movement time. 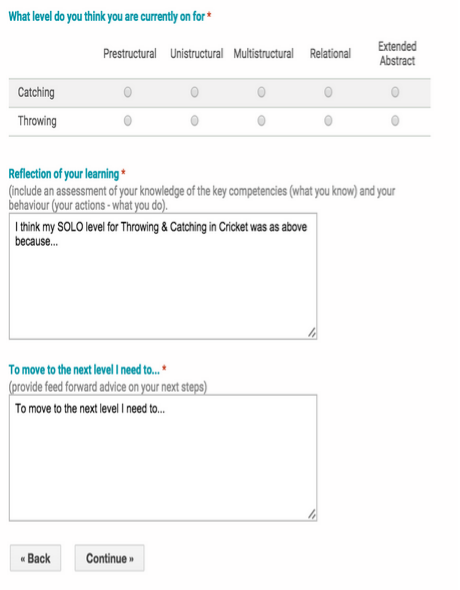 The google form would also have a pre-filled box to help the students start their reflections. After they had submitted, doc-appender went to work appending the documents so that each student had a reflection for each lesson. Similar to a diary or even a facebook feed, documenting their evidence in PE. 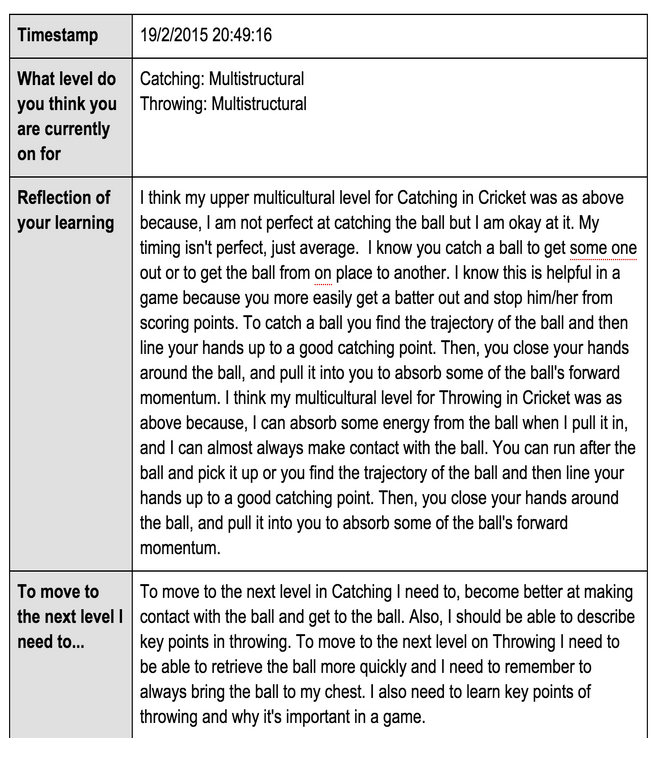 After the final lesson I asked the students to answer a final google form and then doc-appender amending their documents to allow me to read about their performances. This evidence can then be used when it comes to parent-teacher meetings, or when you want to reflect upon the year as a student, it can help with goal setting for future years. How do you record your evidence? What google add ons do you use? Are you a GAFE school? and if so what benefits does it have have for you and your students? How do you produce an effective workflow? How do you promote literacy in PE?